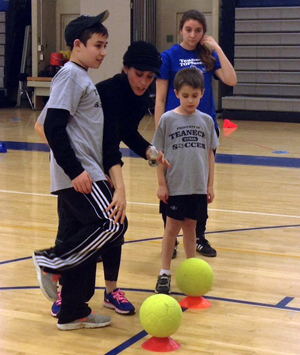 FAQs | Teaneck Junior Soccer League, Inc.
What is unique about TOPSoccer? The program allows each player the opportunity to succeed by individualizing the program to player needs and offering a 1:1 ratio of player to Buddy. This ensures that each player is fully involved and supported and helps to build lasting friendships. A Buddy is an invaluable volunteer who participates directly with individual players to enable participation in a soccer activity. A Buddy is not a player and does not score goals. A Buddy helps the player to succeed and also to keep them as safe as possible. Each Buddy has completed TOPSoccer training and is certified by US Youth Soccer. Who is eligible to play in TOPsoccer? 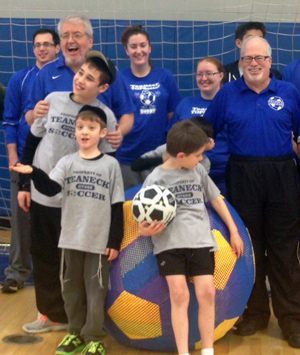 Teaneck residents with disabilities, aged 5-19. Disabilities might include: Autism Spectrum Disorder, Down Syndrome, Learning Disability, Developmental Delay, Muscular Dystrophy, Cerebral Palsy, Vision or Hearing Impaired, Traumatic Brain Injury (TBI) or Attention Deficit Disorder/ Attention Deficit Hyperactivity Disorder. What are the benefits of the program for the players? Players will develop a sense of belonging to a community and learn the value of being part of a team. They also tend to show improved self-esteem, fitness and social skills. Parents provide transportation to and from all sessions and inform Coaches of any pertinent information about the player. The program will offer soccer activities adapted to ensure the player's participation in a safe and healthy environment, while providing parents with the opportunity to network with other families. Players must wear shin guards and sneakers or soccer shoes.